Mr. Local History congratulates the historic Grain House as it celebrates its 250th construction anniversary. In 1768, when the First Methodist Church in North American colonies was initiated at Wesley Chapel in NYC and the first edition of the Encyclopedia Britannica was being published in Scotland, Samuel Lewis, a miller from Franklin Corners in Bernards Township, built a water-powered grist mill and a barn on the Passaic River on land originally acquired from William Penn. His grandson, Richard Southard, bought the property in 1777 and soon found that the convenient location along a major thoroughfare between New York and Philadelphia, so practical for commerce, placed him smack in the middle of the Revolutionary War. His small wooden mill supplied desperately needed flour, meal, and feed to the Continental Army encampment at Jockey Hollow, Morristown, during the bitter winter of 1779-80. Since the barn was used to store the army’s grain during the Revolutionary War, it is still known today as “The Grain House.” As the war moved south, quiet once again settled over the mill. Samuel Woodward, another family member, owned it into the early 19th century. His daughter, Phebe, married a Peapack miller, Ferdinand Van Dorn, who later bought the property. His business prospered, and the little mill, by now a bit long in the tooth, couldn’t keep up with demand. In 1842, he erected a larger stone mill with an inside water wheel system. It still stands on Route 202 opposite this restaurant. The mill is still there today and is known as the Van Dorn Mill. The property passed through several hands in the ensuing years and gradually fell into disrepair, but in 1928 it received a surprising new lease on life. 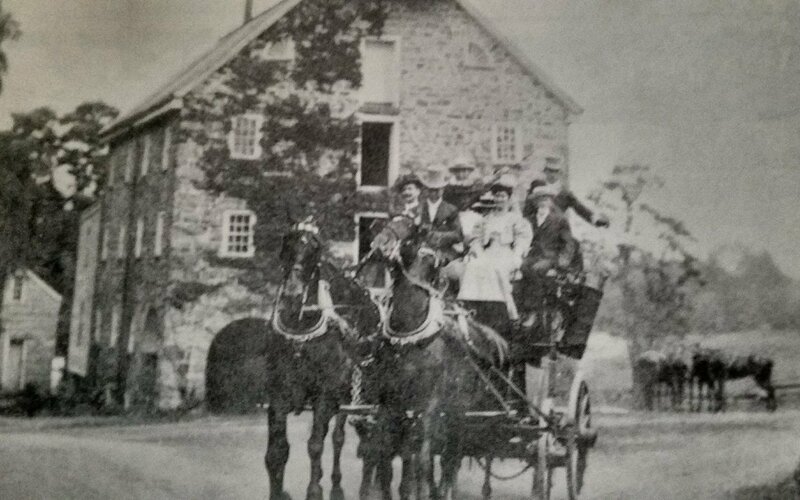 Famous restaurateur William Childs saw intriguing possibilities in the barn standing near the old mill. Accordingly the estate devolved to Marguerite J McMurtry and the two sons of her sister Anna D. Childs. Three heirs to the family willed the 100 acre farm to William Childs (a brother of Luther Childs) of Bernards Township by their deed on September 19,1927, reciting the deed of 1st April 1867, to the Willmere Farm, a New Jersey corporation, of Jersey City, by deed of 27 January 1928. This corporation remained as owner up until December 1958. 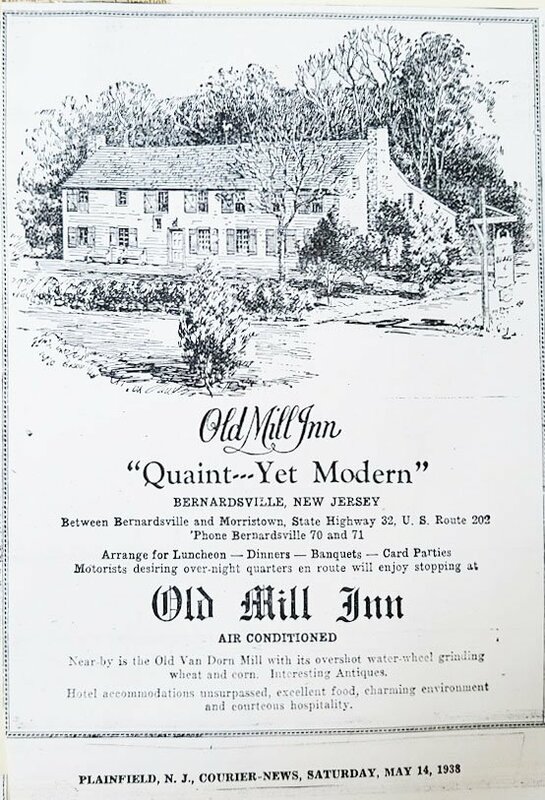 While the barn was originally next to the Van Dorn mill, Childs moved the barn across the road to the eastern side of Route 202 the following year and began converting it to an inn. At the time, the barn’s roof and sides were gone, but the structure was solid. The community area was known as Franklin Corners, reportedly named after Benjamin Franklin. 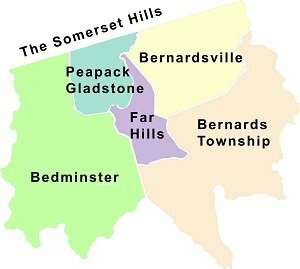 Over the years the location has also been listed as being in Bernardsville, Basking Ridge, Franklin Corners and Bernards Township. 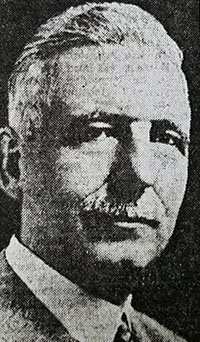 William Childs started a project in 1930 to restore Franklin Corners envisioning a small scale version of John D. Rockefeller’s “Williamsburg, VA” preserved hamlet and called it Willmere Farms. 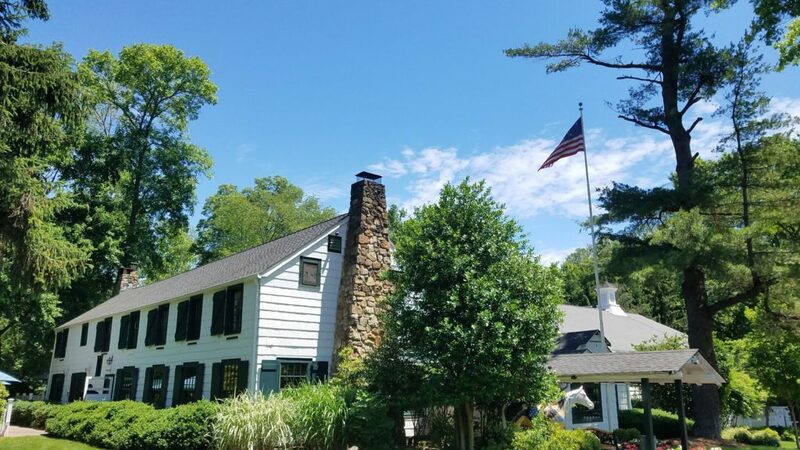 He was also inspired by Longfellow’s Wayside Inn in South Sudbury, MA that was noted in his book “Tales of the Wayside Inn.” He was unable to complete it before he died on May 22, 1938 after a stroke. The area served as Childs’ ambition to create a “Williamsburg-like” active historic community as a real working old time town that people could visit and enjoy. 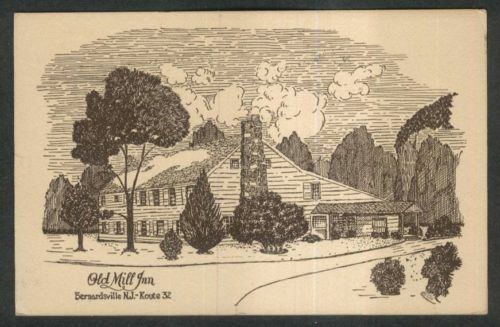 It was noted that there were up to 14 buildings including homes, mills (grist and saw), a blacksmith, barns, one room school, general store, rug maker, guest houses, and yes a restaurant which was first called the Old Mill Inn. None of the lines of the original barn structure have been changed. The upstairs had seven bedrooms. The wagon and machinery room is now the Childs Dining Room. The stable is now the grill. William focused on the grain house and his Revolutionary era hamlet because he almost bankrupt the corporate restaurant business by introducing a vegan menu to the restaurant chain. The board decided Childs was not fit to run the company and was forced out. 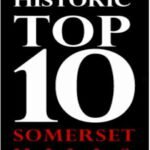 So, William focused on his Franklin Corners project, restoring the Grain House barn and converting it to an inn and restaurant. Rather than gut the inside, however, Childs chose to preserve the classic old structure’s unique spirit through a painstaking restoration. Not a beam was touched in the barn’s solid frame, and it remains to this day as it was more than two centuries ago. Only the functions of the subdivisions have changed. 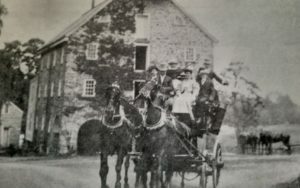 The Childs property started at 50 acres and grew to over 550, comprising the present day Grain House all the way down to North Finley Avenue in Basking Ridge. Since Childs was a devoted member of the Basking Ridge Presbyterian Church, the property you would think would be Bernardsville, was made part of Basking Ridge Many in the area were thankful because the project took place during the Great Depression. Childs was responsible for employing, housing and feeding 50 workers throughout the project. In 1938, over 100,000 people visited the restored mill. William Childs’ Olde Mill Inn was an immediate success and cemented his family’s already sterling reputation in the restaurant business. 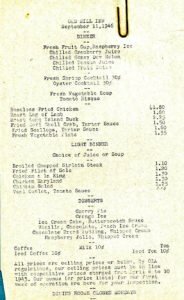 William started the first Childs’ restaurant with his brother Samuel (later a NJ State Senator) in 1889 on New York City’s Cortland Street. Click to Enlarge. 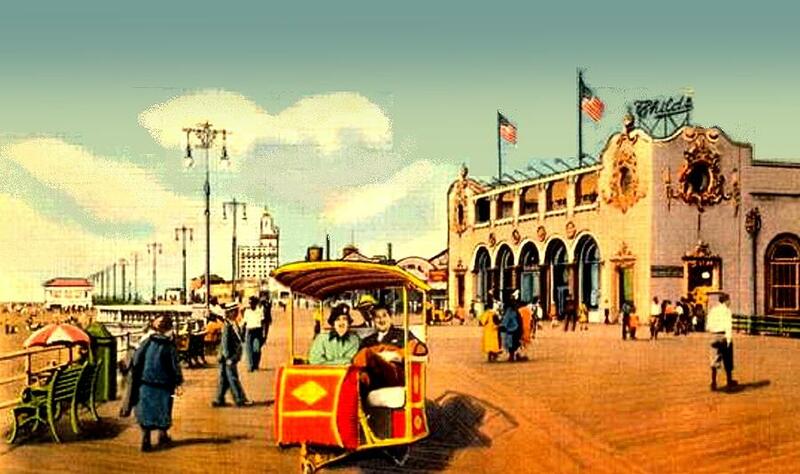 The Childs Restaurant on the boardwalk in Coney Island, New York. These country boys from the Somerset Hills envisioned a grand, cross-country chain, and the Childs’ name eventually graced 107 establishments in North America. They ran one of the largest chains of any kind in the world and served over 50,000,000 meals a year. The Childs’ restaurants were renowned for their large glass fronts and sparkling white walls and tables, and the brothers proved to be not only astute businessmen but progressive employers as well. They were the first in the United States to hire women to wait tables. In William’s words, the Childs’ outstanding success was based on “food as close as possible to that served in the best homes . . . family recipes and absolute cleanliness.” Their concept of moderately priced meals, freshly prepared in a pristine atmosphere in convenient locations. This sounds simple enough today – but in the late 19th century, it truly revolutionized the industry. 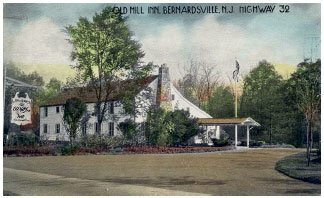 Note the card stating the location as Bernardsville and on Highway 32. Bernardsville is incorrect, but Route 202 was once Route 32. 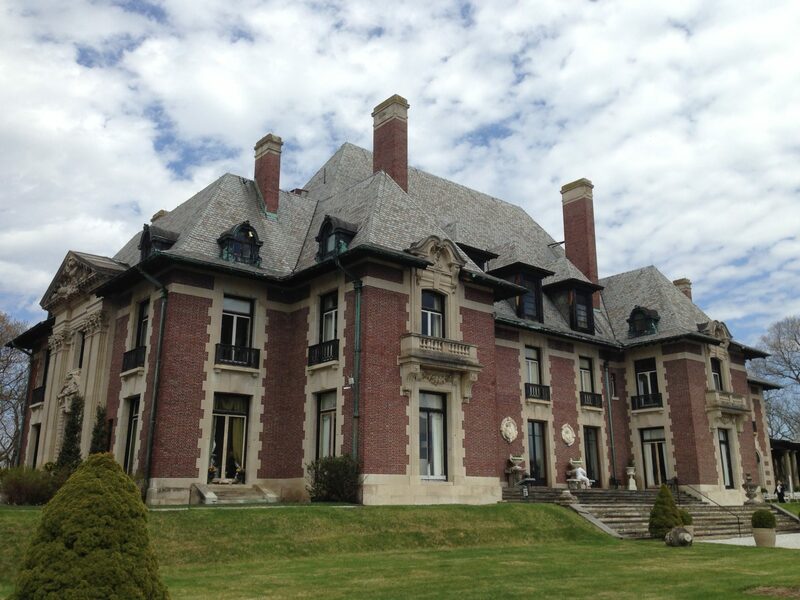 The Childs family owned the property until 1952. Note the differences: namely the town, the road name, the phone number and even the name. 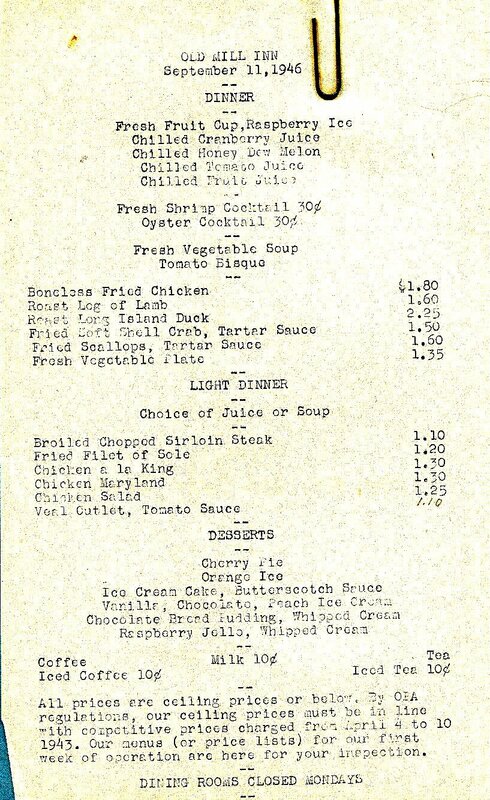 Click image to enlarge a Old Mill Inn 1946 menu. Shrimp cocktail only $0.30! 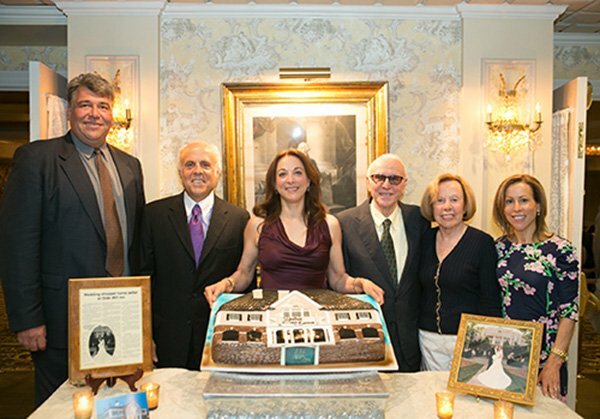 Members of the Bocina Group at their 20th anniversary celebration back in 2014. 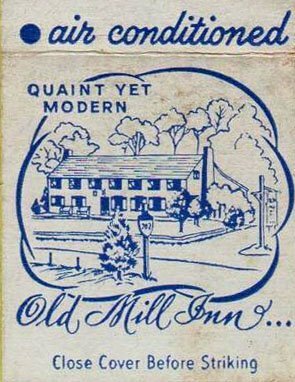 The Olde Mill Inn came on the market in 1992. 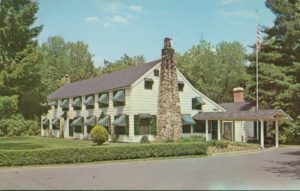 The Olde Mill Inn was a separate facility built in 1977 as a supplement to the old Grain House for use as a hotel, for conferences and social events. By 1993, both were neglected and outdated, and Bocina Development purchased the property in March 1993 and poured millions of dollars into renovations. Bruce Bocina, raised in Short Hills and now living in Basking Ridge, New Jersey decided the effort was worth it. Two years later in on February 4, 1994, the Grain House reopened after being gutted and refurbished in an upscale Federalist Colonial style. For the transformation, they hired architect Dave Minno. Throughout the Bocina restoration, particular attention was paid to update the facility and keep its historic charm. An outdoor patio was added for warm-weather enjoyment. The Grain House remains fundamentally unchanged since Colonial times. Known as the old Southard Barn after being coined the Grain House during the war, during the days of the Underground Railroad, it was said that the barn was used to sequester fleeing slaves. Over the years people have heard strange sounds and doors slamming, coming from what is believed to be the caretaker’s ghost, George. During the mid 18th century, George the caretaker was promised the property, but at the last minute he was written out of the will. Since then, he’s refused to give up his claim to the property and is said to still roam the older parts of the barn. In addition to George’s ghost, there are said to be two others: Justin, a 70 year-old freed slave from Pennsylvania who died in 1858 during the Underground Railroad, and a mystery person who’s been seen walking with Justin. There is also the tale of the Phantom Carriage, a horse drawn carriage seen passing through Franklin Corners. often stopped at night outside the Grain House. Today, the restaurant continues to reflect the family’s dedication to supporting local sustainable farms with a kitchen that offers their bounty, and here Executive Chef Luca Carvello presides. What was the wagon and machinery room is now the William Childs Dining Room. The grain storage area that fed Washington’s army is now The Grain Room The horse stable is the Coppertop Pub, and the bents in the second floor’s great haymow are now individual dining rooms and offices. 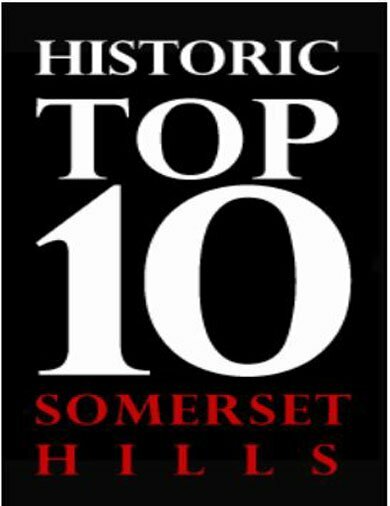 These upstairs rooms include the William Alexander room, the John Annin room, Henry Southard office, the Millicent Fenwick room and the Mary Lewis Kinnan room, all of whom are famous historic residents of Basking Ridge and Liberty Corner. A mural painting of Franklin Corners inside the Grain House restaurant including the Grain House on the left. Upstairs, hallway ceilings are still deeply sloped and beamed, and most of the original windows are small. Like the doors, all are fitted with authentic hasps and ironwork. Haymow space beneath the roof beams were once sleeping quarters, where beds strung with ropes supported straw mattresses. Now they house offices and meeting rooms that are available for private functions, each named for a notable New Jersey figure. 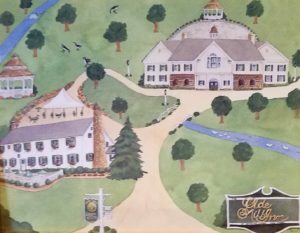 Sheila Palka, the Marketing Director for the Olde Mill Inn and the Grain House, commented, “This is like a museum to me. We went to great lengths to furnish the entire property with antiques according to the period and you can see it clearly here, where the rooms are more intimate. You really get the feel of how people once lived.” Downstairs are stone hearths and striking beamed ceilings throughout. In 2012, a small organic farm was built adjacent to The Grain House. Sheila has since discovered that she is more than an employee: after gathering results from a DNA test and geneaology search, she has learned that she has actual lineage with the Childs family. 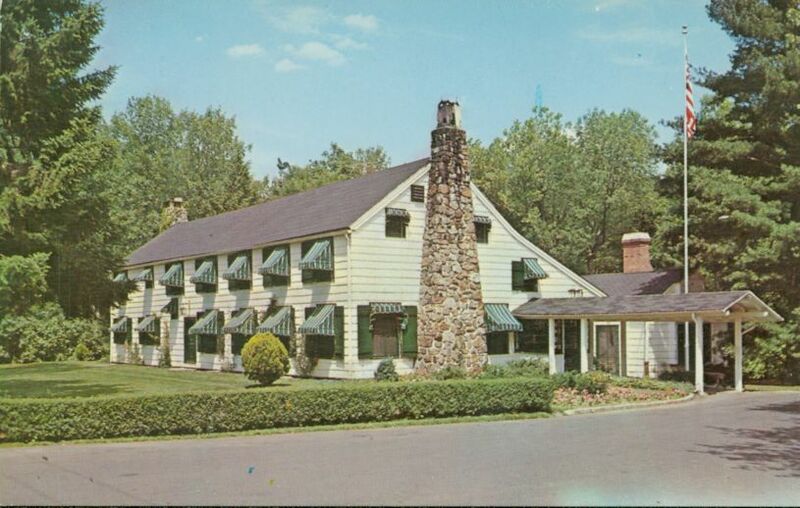 The Bocina Group continues the Olde Mill Inn’s long tradition of affordable elegance. Today’s Grain House, its setting steeped in a gracious era long past, continues to be a local favorite. It is ideal for intimate size parties, as each room of the historic building is a reflection of its historic charm and is fashioned to meet a wide array of needs. Each handsomely decorated room has either a deck or patio attached to accommodate any type of gathering: breakfast meeting, lunch buffet or formal plated dinner with dance floor. 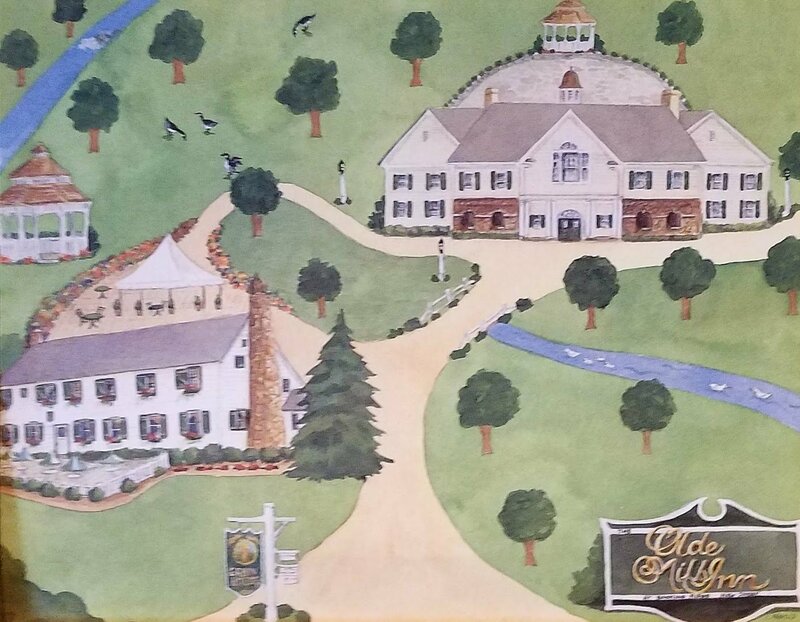 The Grain House, so deeply rooted in our area’s past and so lovingly preserved by all its owners, offers a historic atmosphere of charm and fellowship not duplicated anywhere else in New Jersey. Click to enlarge. A fun rendition of the area that’s painted on the walls of the Grain House. Have any moments you’d like to share?